SOMOS, Inc., a nonprofit dedicated to addressing the needs of New York’s Hispanic population, held its biannual conference in Albany in early March and two members of MedMen’s team were in attendance to discuss the growing legalization of cannabis and how that is impacting communities in a positive way. David Velazquez, co-manager of hospitality, and Jazmin Guzman, retail operations lead, represented the Company, highlighting the wide variety of jobs available in the cannabis industry and taking resumes from interested applicants. They also took the time to discuss how legal and regulated cannabis is creating new economic opportunities. 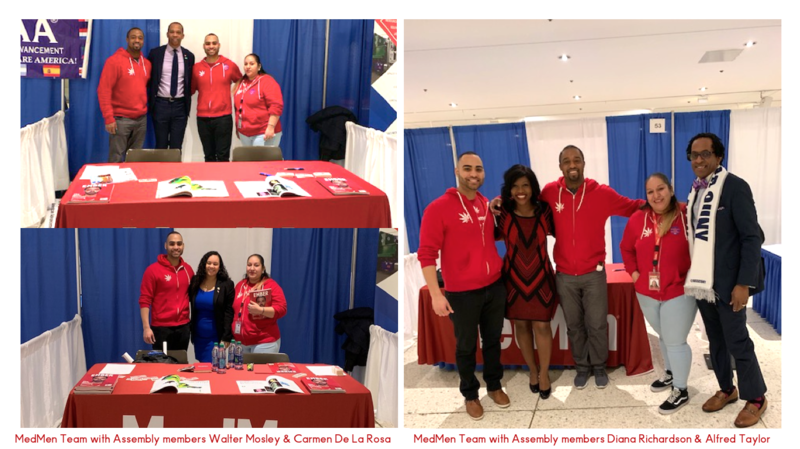 MedMen was a Bronze Sponsor of the conference, which serves as a platform for legislators, scholars, and community business leaders to address issues affecting the community. New York State Assemblywoman Carmen De La Rosa was on hand and said she was particularly moved by Guzman’s story. Guzman shared that she was a DACA recipient -- an issue close to De La Rosa’s heart. Guzman then explained that landing a job at MedMen took her from earning minimum wage to earning well above a living wage, plus stock options and full benefits for both her and her son. Having recently graduated from college, Guzman says she was originally looking to find a job as a pharmacy technician, but quickly realized that even the pharmacies she was applying to were barely paying minimum wage. Instead, she wound up working in the health and wellness industry in an unexpected way through her career at MedMen’s Manhattan store. Guzman and Velazquez took that gratitude and paid it forward at the SOMOS conference, discussing MedMen career opportunities with inquisitive attendees. Whether it was helping to undo decades of misconception around cannabis or helping someone find their dream job, the duo was thrilled to share their passion and dedication to MedMen with the residents and elected officials of New York at SOMOS Albany.